1. When a project first starts, the progress is set to zero and the progress bar total is calculated. 2. First the log archive is queried to find the last successful run. If there was a last successful run, then the amount of actions that executed in that run is used to set the total. 3. If there was no last successful run, then FinalBuilder calculates how many actions are in your project and uses that as the total. For some projects, the above methods to calculate the progress may not be adequate. For example, a project may have two modes (eg. Full and BugFix). The two different modes may have very different progress totals, and using the last successful run action count method will only work some of the time. You can override the estimated total using a either the script method "SetEstimatedProgressTotal", or by using the Set Estimated Progress Total Action. To display a custom status message below the status bar, use the Set Build Status Message action. 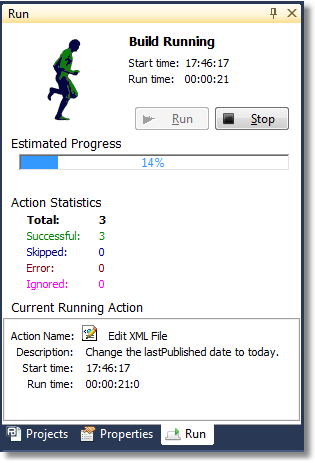 • A "running man" animation to indicate the status of the run. When the project completes this changes to either a tick or cross depending on the result. • Estimated progress of the entire run. The SetEstimatedProgressTotal script method takes a single integer parameter which allows the progress total to be set to any value at any time. This gives you complete control over the estimated progress, and it can be set at any point in your project.